The EverEarth Ramp Racer is a classic eco-friendly product made with timber sourced from renewable forests. Not only is this an educational and fun toy, it helps children to develop their thought processes whilst encouraging imaginative play. Starting at the top of the ramp, kids just have to release any one of the four coloured cars that are included in the set, and excitedly watch them race to the bottom! Ideal for children from 18 months upwards, this toy is powered purely by Kid Energy, with no need for expensive replacement batteries. The wooden Ramp Racer will teach children about forces, pushing, gravity, cause and effect and hand to eye co-ordination. It is beautifully packaged from recycled materials and comes ready to use so there is no construction required. Not only that, it looks attractive and can easily be left on display on a bookshelf or windowsill. 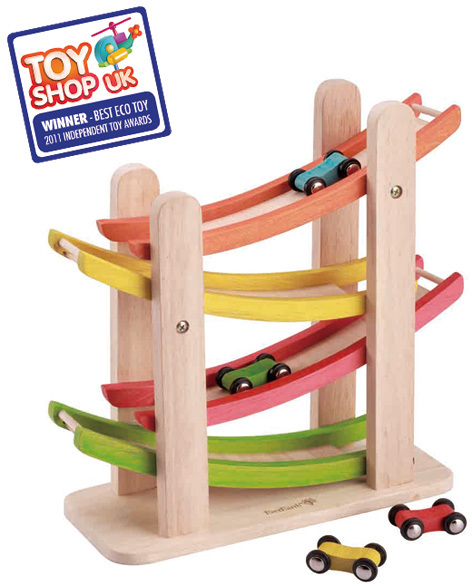 Finished in a combination of natural wood and subtle coloured tones of orange, yellow, red and green, the EverEarth Ramp Racer dimensions are 29 cm high, 25 cm wide and 10 cm deep. This simple yet effective toy can provides hours of fun for younger children, and is robust enough to be passed through several generations. Please tell us what you think of the Ramp Racer by EverEarth.